Every time your canine friend visits the veterinarian, they will wind up on some sort of measuring tool to check their health. The balances most commonly used to weigh dogs nowadays have become indispensible tools, namely in this digital age. Vets weigh animals for a number of reasons. One of the factors vets usually check for is whether the animal getting examined is getting the proper nutrition. Seeing as how there is an increasing variety in the categories of animal food, it’s crucial for vets to check whether an animal is at a healthy weight. Gone are the days when dog breeds received natural indicators telling them that they’re full. As a result of domestication, most dogs have lost the ability to decipher whether they’ve taken in enough food, and in turn, there’s been a growing epidemic of obesity among domestic canines. So what’s the solution? Keeping our dogs on a mark when it comes to their weights is a must for maintaining their health and strength. According to most vets, this factor alone can actually make a world of a difference in enhancing a dog’s vitality. If you’ve attended or watched dog shows before, then you know how competitive they can get—just like any competition. When breeders arrive at shows, they trust a scale’s accuracy to weigh their dogs with precision. Taking into consideration that each unique breed has their own standard weight for their pedigree, judges trust the accuracy of scales, as well. If a participant weighs over or under an assigned weight, that can actually lead to disqualification. The many interface options available today allow veterinarians to weigh the dogs and have the records saved for later reference. Having organized and electronically saved records will ultimately spare the time and hassle of repeating the process of measurement. When load cells are made of stainless steel, veterinary scales are the most robust and can handle being exposed to dust and water. Since it’s highly common for animals to have the tendency of experiencing the effects of a nervous bladder when around their vets, this type of scale is especially useful for making the cleaning process much easier. 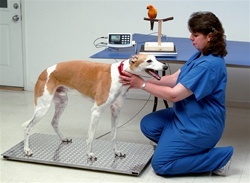 If the vet is happy and has a practical working tool, then the pet being checked will most likely be happier, too. This will then result in a smoother visit, and increase the chances of a proper diagnosis. After all, like humans, a dog’s medication can only be administered at an accurate level when a scale provides accurate results. As mentioned earlier, different breeds generally have a great variance in weight, so it’s impossible to generalize. Even with all the influential factors these days, dogs within the same breeds will always weigh differently. Some scale models will read out a weight that might appear to be at a small difference as compared to other scales, but in fact, just the slightest disparity that could be a fraction of a pound will have a major impact on the type of treatment a dog receives, whether it’s at a show or at their vet’s office. Considering the fact that some breeds can weigh up to two hundred pounds (if not more), many dog scales are made to handle the sizeable weight. Not all scales are the same, of course; they differ in the features they offer. Some are small and practical enough for weighing puppies, while others are characterized by a low, floor height stature. The lower scales make it easier for dogs to hop on and off of with little pressure. Specialized software is available on digital scales. This sort of software will adjust to accommodate the shakiest dogs. It’s made to handle movement and instances when a dog will squirm around. This adjustment is necessary, regardless of whether the scale is being used by the breeder or vet. In just a matter of a few seconds, the scale user will get a total of several varying weight readings. All the readings will then be processed and the averages of these readings will be recorded. In order to get the most precise measure, the results will exclude the readings that result from sudden movements by the dog. A large digital display will read out the correct weight that was locked in. As a pet owner is standing outside the vet’s patient room, they can get a glance of the results shown on the digital display and keep track of their beloved pet as they’re getting treated. When a canine-owner and a veterinarian both get a view of accurate results displayed on a scale, it will lead to healthier decision-making. Arlyn Scales has a large range of precise digital scales catered to record the most accurate readings. Whether you need a scale for livestock or would like to purchase corrosion resistant scales, at Arlyn Scales, you’ll get the high quality you deserve. Contact us today to learn more about our products and services.